Carrots are full of fiber and are rich in vitamins and minerals. They are rich in beta carotene, a powerful antioxidant which helps in maintaining a healthy skin and also keep away from many diseases. The carotene in carrot is good for the eyes. When eaten raw, they cleanse and strengthen the teeth. It helps in cancer prevention and has anti aging properties. Regular consumption of carrots prevent digestive disorder. 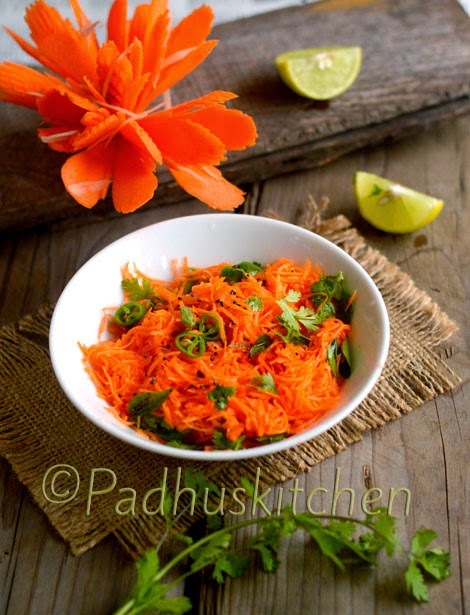 Carrot provides us with a host of powerful health benefits,so try including it raw in the form of salads or raitas. Wash, peel the skin and grate carrots finely. Heat a tsp of oil, add mustard seeds,when it splutters, add green chillies and curry leaves. Saute for a second and add to the grated carrots. Mix well, garnish with coriander leaves and serve with rice or sambar sadam or curd rice.